When most people think of spring cleaning, they usually think of their house. You probably spend more time than you think in your car, so give it some TLC this spring. If you live somewhere with wintery weather, your car exterior may be caked with salt and dirt. Your interior may not be much better. Here are some tips to spring clean your car and get it in tip-top shape for summer. If you are anything like me, the first thing to do is clean out any trash. While dashing in and out of the car, countless crumpled receipts, gum wrappers, and the like may have been deposited in your car. It doesn’t hurt to go through your various compartments and organize while you are at it. Don’t forget about your trunk! Double-check that your spare tire is in good repair and that your emergency kit is stocked. If you have a lot of large debris, shake out your mats. Use carpet cleaner to get out any stains and vacuum the entire interior or your car, including the trunk. Using a damp cloth, wipe down your seats. If you have dog hair, spray with water to loosen the hair and then wipe with a squeegee. Wipe down your entire console (including cup holders) and dashboard. Take care to make sure you thoroughly dry the top of your dashboard. If you have hard to remove sticky spots, use Goo Gone and a rag. Carefully inspect your car exterior. Note any points of repair. 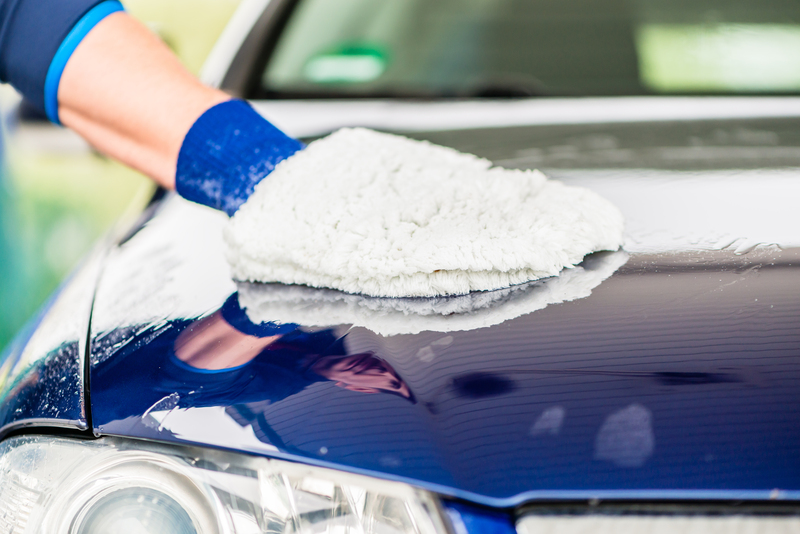 Using warm water and a mild detergent, thoroughly wash your car to get rid of all that winter grime. Use a microfiber cloth and the two bucket method (one bucket of warm soapy water to clean with and a bucket of water to rinse the rag in between dips in the soapy water) to prevent scratches. If you want to go the extra mile, wax your exterior using a spray or liquid wax. Be sure to test the product on a hidden part of your car to ensure it won’t damage your finish. It may be surprising, but leaves and debris can make their way under your hood. Wiping down the edges should be sufficient. If your engine is particularly dirty, consider have it professionally cleaned. After all the salt and dirt that accumulates on your car during winter, your windows probably need a shining. Clean inside and out with glass cleaner and shine with a dry towel. Repeat on any and all mirrors as well. It’s possible your windshield wipers may have taken a beating during the winter so examine them closely. If it looks like they need replaced, find step-by-step instructions here. Finally, don’t forget about those tires. Remove your hubcaps and hose them down. Scrub your tires and wheel wells and check your tire pressure. Low? Fill them up. This is also a good time to tighten any loose lug nuts. Now that you have successfully spring cleaned your car, double-check when your car last had an oil change and make sure to schedule one if its due. Test your A/C to make sure it is working properly and consider an engine tune-up to make sure your car is ready to take on the heat of summer. Not only will your car run smoother, but you can bask in how clean it is… until it’s time to to clean it again.